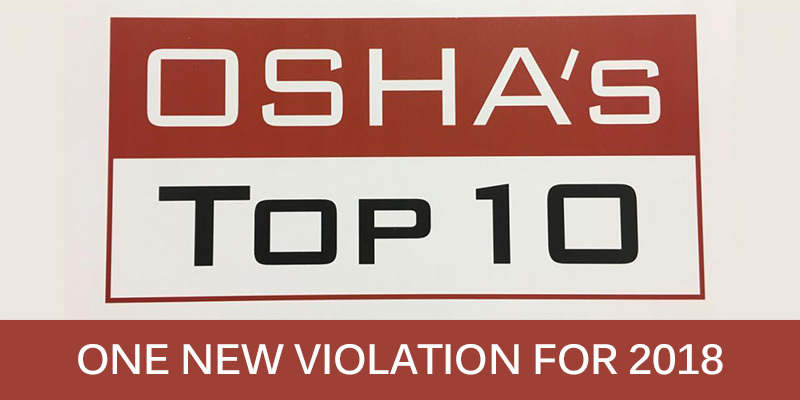 As expected, OSHA announced 2018’s Top 10 Violations this past week and the only surprise took the #10 spot. This past year, 1,536 violations citing CFR 29 126.102 were recorded—that’s the standard for Personal Protective & Lifesaving Equipment that focuses on eye and face protection. As I noted two weeks ago, this list helps safety professionals, particularly facility managers, target areas for improvements and review. Given the growing number of PPE citations and the fact that Fall Protection training requirements climbed the list for a second year, all of us should be reviewing those areas of our safety policies and evaluating the instructional efficacy of our educational programs. Again, the reason these Top 10 OSHA Violations persist year-to-year is that the majority of facilities in America believe that their policies are sufficient and their safety programs are up-to-date. Before joining that club of companies that discover they are mistaken (via inspection or injury), consider contacting The EI Group and allowing our EHS experts to assist you. Our safety professionals offer decades of experience addressing all OSHA standards and look forward to fortifying your program via mock OSHA audits, program assessments and wide-ranging training topics committed to protecting your workers.